Dr. Kevin Johnson and aesthetic nurse Brittany Rayson use a laser for tattoo removal at Spokane's Advanced Aesthetics. The trend of embellishing skin with art has blossomed over the past couple of decades to the point that, according to the most recent Harris Poll in 2012, roughly 20 percent of Americans have a tattoo. Another industry has risen alongside that of tattoo artistry, though, as many eventually realize that they actually don't want that art to be permanent after all. In 2012, there was a 43 percent increase in the number of tattoo removals over the year before. Tattoo removal is, in fact, booming. Sometimes it's for a job. Sometimes it's because an artist didn't make that dragon look quite right. And often it's because a couple has split, leaving one or both parties with unwanted ink reminders of love gone wrong. "Exes!" Jacklyn Blindauer says when asked why people visit Silver Safari Body Piercing and Tattoo Removal at Spokane's NorthTown Mall. "People who just got divorced, I think that's the majority of our [tattoo-removal] clients." Wedding-ring tattoos are a big part of the removal business at Advanced Aesthetics, too, according to Brittany Rayson, an aesthetic nurse at the firm that runs clinics in Coeur d'Alene and Spokane, using lasers to, among a variety of other health and beauty functions, remove unwanted ink. "I've been surprised with the number of messed-up tattoos that we do," Rayson says, "ones that have just obviously come out different from what they were going for. There are a lot of misspelled words." While he's only been doing tattoo removal for about three years, when the laser technology improved to the point that the results were good enough to offer at Advanced Aesthetics, owner Dr. Kevin Johnson figures he's seen as many different reasons to remove tattoos as he's seen types of people who get tattoos. Names of exes are high on the list, as are employment issues. Others simply outgrow what was a youthful decision, done on a whim. "A lot of the time it's women who are generally in their 30s who now have children, and they got their tattoo when they were 19 years old and it seemed like a good idea when they were on spring break," Johnson says. "They decide now that they don't want their kids to see their 'tramp stamp.' Or it's just changed over time, faded." A patient getting started on the process of tattoo removal. Sitting in his downtown Spokane office, Johnson calls up statistics on the most likely people to get a tattoo removed in 2015. Sixty-nine percent of them are women, most are single and college-educated, between the ages of 24 and 39. One of his early patients when he got into tattoo removal, though, fell far outside those "typical" parameters. "One of our first patients was my dad. He's 77," Johnson says. "He had his tattoos, he got them when he was in his teens, and he's felt bad his whole life because his grandmother cried when she saw his tattoos. He's glad to have them gone." Christina Dahm, a 26-year-old Spokane resident, decided to have the large tattoo on her shoulder removed, even though she loved the message behind the Day of the Dead-style design dedicated to her grandmother's memory. Dahm designed the piece herself, but "it didn't quite turn out the way I wanted. I wanted to create something that would commemorate her life and memory, while also showing that she has passed away," she says. "I did love the tattoo and what it represented, but it didn't really capture who she was." Dahm explored different removal methods before deciding on laser removal. She consulted with Advanced Aesthetics, talked to Johnson and eventually had Rayson start work. Her timing couldn't have been better, as Advanced Aesthetics got a new PicoSure laser, which Johnson says is the latest and fastest available. To Johnson, the advantage of laser removal is the minimal scarring compared to other means. The goal, he says, is to "remove the ink completely so that it looks like the skin never had the tattoo, like there's no ink there and also no bad scar." Avoiding scarring was the main reason Dahm chose to go with laser removal. The PicoSure laser works by sending a barrage of ultra-fast laser pulses into the skin. They shatter the embedded tattoo ink into small particles that the body's immune system can then destroy on its own after that initial assist. A silver-dollar-size tattoo can be treated in just a minute, and a tattoo can sometimes disappear in just a couple of sessions, depending on the ink used and the individual's body. "If you can imagine the ink as a rock, we're breaking it down into pebbles and sand, allowing the immune system to come in and gobble up the ink and process it and make it go away," Johnson says. "Similar to healing a cut, the scab cells come in and eat up the debris." The process is not painless, but Dahm says it "didn't hurt any more or any less than getting the tattoo." "The best way I can think to describe it would be if someone were to pinch the back of your arm very lightly over, and over, and over again," Dahm says. "It's not a pleasant feeling by any means, by anyone's standards. But I thought I was going to be in serious pain. Come on, it's a laser!" Some turn to creams or other means to remove their tattoos. At Silver Safari, they use a product called Tattoo Vanish. "Basically, we open that top layer of skin [with tattoo needles], we put in that Tattoo Vanish, let that soak in, and then you'll scab up pretty typically for two to three weeks," Blindauer says. "When the scab forms, it will pull the ink with it, so ink is pulled with the scab." This method also can take multiple visits, depending on the person and tattoo. Currently, the FDA states that is has "not approved tattoo removal ointments and creams." In the future, tattoo removal may become less difficult. 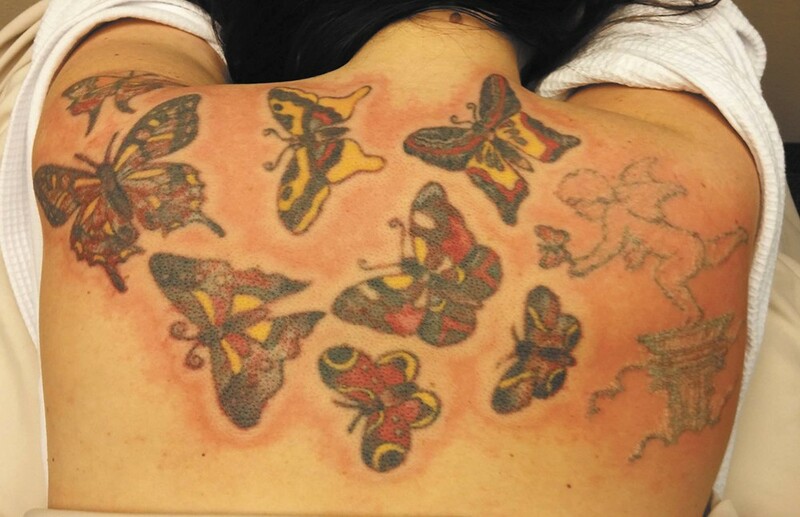 Non-permanent tattoos using micro-encapsulated inks that disintegrate when hit with a laser are already being marketed under the name Infinitink. As of now, there are no published data on the safety or efficacy of these inks. Meanwhile, in Canada, a researcher at Nova Scotia's Dalhousie University developed a process to cause skin cells to relinquish tattoo pigment. It's still in the testing stage, and after a flood of inquiries, researchers announced they do not need any test subjects.